hey say that you may never remember a particular year, or a particular day or even a particular hour. However you will always remember a moment. A perfect lake home is full of so many moments to cherish forever. Like the moment you see the first life long love of the loons at your dock, or the calm early morning kayaking when the cool mist rises up around you to the warm spring air, or the gigantic fish that got away, or the time you successfully jumped off the dock with all your grandkids in tow. For the owners of 74 Edgewater Drive, those moments are forever ingrained into their everyday with annual flags emblazoned with the hand written names of all the kids who stayed and posted signs of the locations of their friends who visited. Now it is time for your moments to be remembered. Swains lake is the perfect full activity lake for all water sports, fishing, swimming and quiet times. The home with its 4 car garage, Open plan kitchen and great room, plenty of gathering places, a second separate great room with cathedral ceilings, bath and plumbed for an additional kitchen, multiple decks to entertain and a rare private level yard and 240 feet of frontage to call your own. When you think of life on the lake perhaps you Everything else inside and out is ready to make life long memories on the lake. OUTDOR HOME FEATURES • Large slate patio with stone fireplace • 20’x15’ fenced garden plot • Lanterns along 180’ driveway • Stone steps leading up to columned entryway • Large entry hall with built in cabinets and counters. INTERIOR HOME FEATURES • Open concept kitchen with ample storage and counters. • Slide out spice racks and pot holders. • Large vaulted family room with wall of windows toward lake. • Flueless propane fireplace with temperature controls. • Ceiling fans and recessed lighting. • Floor power outlets • Pocket doors to master bedroom • Private deck off master bedroom. • Laundry in master bath • Bay window on stairway to lower level. • Tile floors throughout main house with exception of carpet in bedrooms. • Sunny family room on lower level. • “Lake Room” on lower level with glass door to back yard, full bath, utility tub, refrigerator and second laundry. • Root cellar with trap door access. 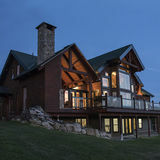 Outdoor Living • Total of three Trex decks, two large for entertaining and one smaller off MBR. Lakeside drive well off Lakeside Road Motor boats, fishing boats, paddle boats, canoes and kayaks are all allowed on Halfmoon Lake. There are no public beaches, but several vacation rentals have private beaches. 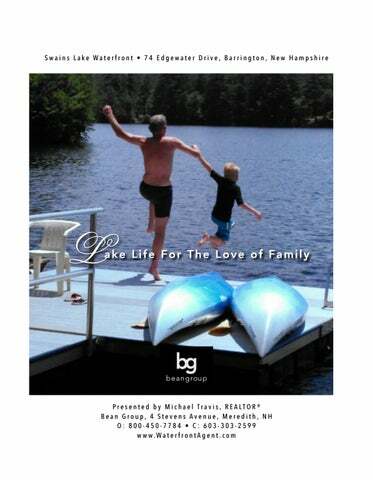 ed in 1975, and has been commited to One of the prime lakes in the town of Barrington in Strafford County set against the backdrop of conservation land and fine lake homes is a beautiful, quiet lake in New Hampshire close to the Seacoast, UNH, and all that makes New Hapshire great. It has a couple of islands and many coves hiding some great fishing spots. The lake covers 341 acres with a maximum depth of 25 feet. Classified as a mesotrophic lake, it is a moderately fertile lake supporting healthy populations of fish. Pickerel, horned pout, and white perch all make their home in the lake, and anglers can try their luck against the lake’s largemouth bass. ported workers at the Lamprey River Iron Works, chartered in 1719 by the Massachusetts General Court to encourage industrial development in the province. est town, its primary industry the smelting of iron ore.
off from Barrington, reducing its land area by about half, because of lengthy travel required to attend town meetings. Mountains. It is also around 90 minutes to Boston. ries for generations to enjoy. Make it The place to be for your lake home.